Image Credit: U.S. DoD photo by Petty Officer 2nd Class Sean Hurt/Released. Defense Secretary Ashton Carter made his first trip to Tokyo this week. On Wednesday, U.S. Defense Secretary Ashton Carter visited Tokyo and held meetings with Defense Minister Gen Nakatani, Chief Cabinet Secretary Yoshihide Suga (who is also responsible for reducing the burden of U.S. bases on Okinawa), and Prime Minister Shinzo Abe. This is Carter’s first visit to the country since February, when he assumed his position as defense secretary. 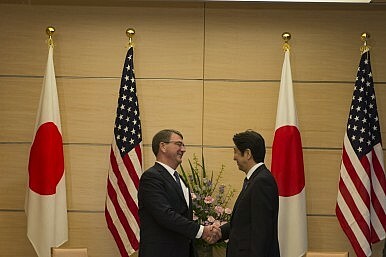 Nakatani and Carter met as part of the process of revising the U.S.-Japan bilateral defense cooperation guidelines and agreed to settle the matter as quickly as possible. In addition to the usual rhetoric about strengthening the relationship so the alliance can take on a global role, the two agreed to cooperate in outer space and cyberspace. A new working group will be established for this purpose. Carter also condemned the unilateral use or threat of the use of force to change the territorial status quo in the East China Sea, and confirmed Obama’s 2014 position that the alliance covers all territories under Japanese administrative control, including the disputed Senkaku/Diaoyu Islands. The two also affirmed that the relocation of U.S. Marine Corps’ Futenma Air Station within Okinawa will continue. Suga, while upholding the relocation, also requested that the U.S. return facilities and land south of Kadena* Air Base in Okinawa earlier than originally planned. This may be an attempt to ameliorate concerns held by Okinawa Governor Takeshi Onaga’s, whom Suga met for the first time on Sunday for talks. Okinawan citizens have become very adamant in objecting to the relocation, and want the burden of hosting U.S. troops to be shared more equitably across Japan. During Carter’s 30-minute meeting with Abe, both men agreed that the revised bilateral defense guidelines would reflect Japan’s new legal framework for national security. Abe said, “I want to strengthen the deterrence [of our alliance] by actively pushing ahead with settling on the guidelines and the new legal framework for Japan’s national security.” Abe also pledged to move forward with the realignment of U.S. forces in Okinawa, and called for U.S. cooperation to reduce the burden on Okinawa. In a written interview with Yomiuri Shimbun, Carter stressed the importance of future-looking relations between Japan and South Korea. Enhancing U.S.-Japan-South Korea security cooperation is a vital component of the United States’ “rebalance” to Asia. During the trip, officials also confirmed a two-plus-two meeting between U.S. and Japanese foreign and defense ministers on April 27 to approve proposed revisions to the bilateral guidelines. A 2+2 meeting in New York set the stage for Japanese PM Abe's visit to the U.S. What issues were on the agenda?